GoldenEye is the seventeenth spy film in the James Bond series, and the first to star Pierce Brosnan as the fictional MI6 agent James Bond. Released in 1995, the film was directed by Martin Campbell and unlike previous Bond films, is unrelated to the works of novelist Ian Fleming. The story was conceived and written by Michael France, with later collaboration by other writers. In the film, Bond fights to prevent an arms syndicate from using the GoldenEye satellite weapon against London in order to cause a global financial meltdown. 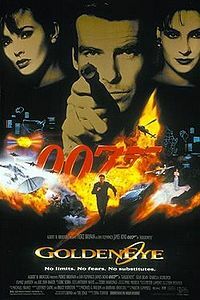 GoldenEye was released in 1995 after legal disputes forced a six-year hiatus in the series, during which Timothy Dalton resigned from the role of James Bond and was replaced by Pierce Brosnan. M was also recast, with actress Judi Dench becoming the first woman to portray the character replacing Robert Brown. GoldenEye was the first Bond film made after the dissolution of the Soviet Union and the end of the Cold War, which provided a background for the plot. The film accumulated a worldwide gross of $US 350.7 million – considerably better than Dalton’s films, without taking inflation into account. Some critics viewed the film as a modernisation of the series, and felt Brosnan was a definite improvement over his predecessor. The film also received award nominations for “Best Achievement in Special Effects” and “Best Sound” from the British Academy of Film and Television Arts.